This Is Not Your Father's Dance Studio! At Dance Class Saskatoon we believe in offering the student quality instruction at affordable prices. No matter what your dancing goal, our patient, qualified, experienced and friendly staff will ensure you reach that goal. We believe that in order to achieve the rewards of dancing, it should be a pleasant learning experience in a modern, friendly atmosphere. We not only teach dancing, but show you how to practice on your own. You proceed at your own pace and have the option of learning in private or semi-private settings. We know dancing keeps you in great shape as it is felt in every fiber of your body. 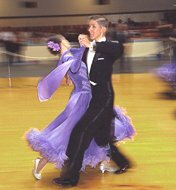 Who can resist swaying to a romantic song or tapping a foot at a jumpin' jive solid groove? At our studio, learn to lead or follow ... no partner required. so we can share it with our other students!